Brilliant! Why use a complicated, electrical solution when a simple, mechanical one works? Apparently the poster of the video doesn’t like negative feedback so they censor it. Good job commies. welcome to hackaday where we censor every comment to ensure the world is just fantastic! IRL these types of “hacks” are fluff and serve no purpose other than to fill up the front page and keep the drones at bay. It’s not being censored here, but on the YT page it self. They’ve disabled ratings on all their videos to avoid seeing the harsh truth that they’re as interesting as any interpretive dance troupe. As in they’re not interesting at all and nobody likes them. Hey, sorry about the knee-jerk reaction to delete your comment on our YouTube video. You are right, we really shouldn’t be editing comments like that. We have removed the block on the “like” button and you are welcome to comment again. We do appreciate constructive criticism. Not sure what the bitching is about, looks like I missing the fun. Anyway, video looks alright. WIth some better music it might even be an enjoyable video. Embedded in the end of each tube is a bright LED flashlight. A sliding blue filter positioned inside the tube provides the silky smooth transition between colors – no fancy electronics required. Did HaD even watch the video? That’s not how it works. 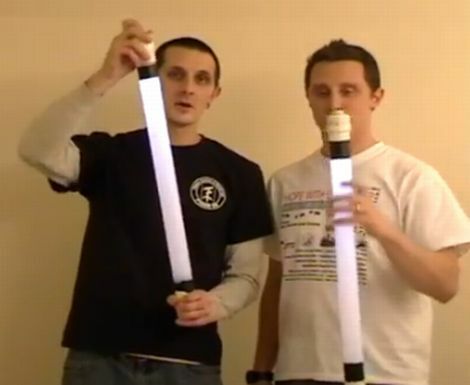 The tubes have an led flashlights at each end, one is filtered blue. Then there’s a ball in between the two that rolls back and forth blocking the light. Eh… i think you missed the point… no offence. That’s pretty sweet! A ton of well put together ideas on their site. Am sure we’ll hear more from them cause they are actually using the type of tech us nerds make. I’m just wondering how many times they’ve popped each other while practicing!